WASHINGTON — President Trump and his Republican allies went on the offensive Monday, vowing to pursue and even punish those responsible for the Russia investigation now that the special counsel has wrapped up without finding a criminal conspiracy to influence the 2016 election. Trump, grim-faced and simmering with anger, denounced adversaries who have pounded him for two years over Russian election interference, calling them “treasonous” people who are guilty of “evil deeds” and should be investigated themselves. “Those people will certainly be looked at,” he said. On Capitol Hill, the Republican chairman of the Senate Judiciary Committee said he would do just that while also calling for a new special counsel to look at the origins of the last one. White House officials and Republican lawmakers demanded the resignation of a Democratic committee chairman investigating the Russia matter, and Trump’s reelection campaign lobbied TV networks to blackball Democrats who advanced the collusion theory. The assertive posture indicated that despite initial calls by Republican leaders to move on after the investigation by Robert Mueller, the president and his supporters were intent on turning the tables on his foes. While Democrats saw the actions as revenge, Trump’s defenders said they wanted accountability for a “witch hunt” that has consumed half of his term. The approach, if it lasts, contrasts with those of other presidents who survived major scandals. After the Iran-Contra affair, President Reagan happily dropped the subject and focused on arms control talks with the Soviet Union and other issues. After being acquitted at his Senate impeachment trial, President Clinton was just as eager to move on to Social Security and other initiatives. But Trump and his allies sought to put his foes on the defensive and cement the view that Mueller’s report represents complete vindication. Mueller found no conspiracy between Trump’s campaign and Russia, but he pointedly declined to exonerate the president on obstruction of justice, according to a Justice Department letter to lawmakers Sunday. 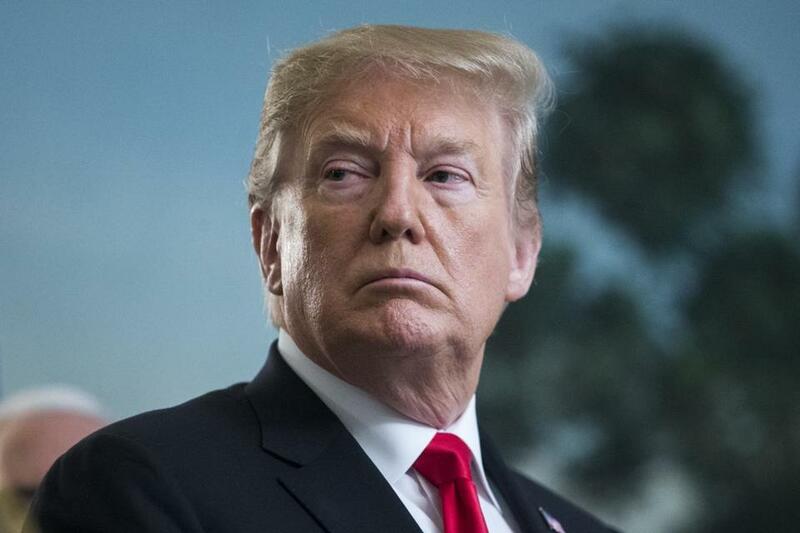 Mueller’s report has yet to be released, so it remains unknown whether it includes damning new details that question the actions of Trump or his associates, even if they do not represent a crime. Democrats in Congress are pressing Attorney General William Barr to release the full report. Trump said Monday that “wouldn’t bother me at all,” but Senator Mitch McConnell, Republican of Kentucky and the Senate Republican leader, later in the day blocked a nonbinding resolution — already passed unanimously by the House — calling for the report to be made public, arguing that Barr should decide. Democrats struggled to find a path ahead, with some urging the party to turn its attention to policy differences with Trump. House Speaker Nancy Pelosi has credited such a strategy with fueling last year’s midterm election victories and said she opposed trying to impeach the president “unless there’s something so compelling and overwhelming and bipartisan.” She plans to unveil a health care plan Tuesday. Republicans faced their own choice. After two years shadowed by Mueller, Trump has the opportunity to reset his presidency, but as he strode with new confidence into a post-Mueller world, he appeared more intent on payback. Stephen Bannon, his former chief strategist, predicted that Trump “is going to go full animal” now that Mueller has wrapped up. The president, Bannon told Yahoo News, will “come off the chains” and use the findings to “bludgeon” his opposition. Others close to the White House urged the president to instead focus on his own agenda. “The president has a unique historical opportunity, while in his reelection cycle, to reconnect to millions of Americans who have assumed he was guilty of serious wrongdoing, due to the unrelenting irresponsible media coverage of fake collusion,” said Matt Schlapp, chairman of the American Conservative Union. Instead, Graham said, the president should leave it to him to go after the authors of the Russia investigation. As chairman of the Senate Judiciary Committee, Graham announced he would investigate anti-Trump bias at the FBI and Justice Department and called on Barr to appoint a second special counsel to study the same issues. Kellyanne Conway, the president’s counselor, and Representative Kevin McCarthy of California, the House Republican leader, called on Schiff to resign as chairman. Trump’s campaign released a memo from communications director Tim Murtaugh warning television producers against booking Democrats who had claimed on their networks that there had been evidence of collusion with Russia. ‘‘At this point, there must be introspection from the media who facilitated the reckless statements and a serious evaluation of how such guests are considered and handled in the future,’’ Murtaugh wrote. Trump’s next rally is set for Thursday in Michigan, a state he narrowly won in 2016.